Taking your business online is one of the best moves you can make to improve the exposure and revenue of your brand. It can open up a new client base that isn’t limited by geography, and gives you new ways to increase word of mouth, customer incentives, and engagement with your local community. That said, launching a new website can be intimidating, even with a host of website builders that are easy to navigate, and which can walk you through the steps needed to maximize the benefits of putting your business online. What to Consider When Creating an Ecommerce Site? Ease of use is a very important factor for a business owner setting up a website for the first time. Many of the best website builders like Wix and Sitebuilder feature a drag-and-drop interface which is intuitive and simple to learn in just a few minutes. There’s a possibility that you may still have some trouble getting set up, and with sites like GoDaddy, you can pay extra to have the site’s designers create a site for you. Customer service is extremely important, no matter which company you chose. You could face problems with site design, plug-ins, integrations, or possibly with processing payments. On BigCommerce, one of the leading business website platforms, you can easily access the support team 24/7 via phone or email, and also access an extensive knowledge base. You’re also going to want to be sure that your Ecommerce website is scalable and can grow with your business. Web.com is one of a number of website hosts and builders that provide ample disk space to accommodate an expanding website. Many website builders also provide web hosting, so you can sign up for a package that will include both at an attractive price. In addition, you’ll want to check the different integrations available with the platform. Does it allow you to run a Facebook store? Is there a PayPal button or widget and can it work with targeted email marketing companies like MailChimp? The ability to integrate with leading Ecommerce and marketing programs can make a major difference when looking for ways to both make your site work more professionally and expand it to a wider customer base. Finally, a rich assortment of templates can give your site an eye-catching look that can help boost sales and customer engagement. Most website builders feature a wide array of templates that are tailor-made for a variety of sites, as well as paid templates that can be a bit more pricey. For business users, Wix offers financial management, site analytics, traffic generation and options for setting up coupon codes and shopping carts for customers. An online store is only available in the Ecommerce or VIP packages, so the more affordable plans are not an option for a small business trying to move their store online. Wix has become one of the most popular website builders in the world, largely due to its intuitive drag-and-drop interface and rich variety of templates. Wix has a built-in image editor, which can help you build a stunning website to make your business stand out. Through the Wix App market you can shop from hundreds of rich features and apps made by Wix and third parties, including an app that allows your Wix site to run a store on Facebook. SiteBuilder combines an easy to use drag and drop interface and over 1,000 available templates to create a website-building platform that even a novice can master to set up their Ecommerce site. The only option that allows you to run an online store is the Ecommerce plan. With the Ecommerce plan users also receive priority support, which can come in handy when you’re just getting set up. Overall, Sitebuilder has received rather poor reviews for customer service, and the company does not offer a phone line that users can call directly. 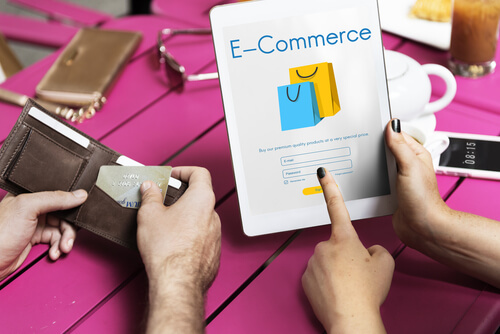 If you’re looking to run an online store you’ll need to opt for the Ecommerce plan, which comes with SEO tools and analytics that you can use to your advantage. Sitebuilder is relatively limited when it comes to integrations, though they do allow shop integration with the Ecommerce plug in Ecwid and the addition of a PayPal button. If you’re a bit uncertain about what to put on your site or how to design it, Web.com offers a rather unique option. The “Do It For Me” service allows you to have Web.com experts design your site for you, beginning at around $114.95. If you’d prefer to design the site yourself, that is also an option, though Web.com has received less than ideal customer reviews when it comes to the interface and ease of use. For online business, there are three Ecommerce options available, and the site will walk users through the process.The e commerce packages come with analytics and reporting and SEO on all packages, while email marketing is included in the standard and pro packages. If you only have 20 or fewer products, the $29.95 express package may be enough, but you’ll miss out on a number of features. Not only that, but with the standard and pro packages you pay only a 1.5% and 1% transaction fee respectively, which can make a big difference on your bottom line depending on the volume of your sales. You can also opt for the Do-It-For-Me package for your Ecommerce store, and allow the experts to not only get the site up and running, but also to custom-design it for the type of business you’re running and your company goals. GoDaddy is is the world’s largest domain registrar and has become something approaching a household name, in no small part to the Super Bowl ad campaigns the company has run. GoDaddy offers a number of domain hosting packages and an Ecommerce options that should be able to meet your needs. The company is also known for having very dependable tech support which can be reached around the clock by phone and chat. The GoDaddy online store plan comes with coupon codes, secure checkouts, and is mobile optimized. It can also integrate with GoDaddy and third-party apps, including for email marketing, menus and price lists, and payment programs like PayPal. GoDaddy is more known as being a domain hosting site, but the website building options are solid, and feature a drag and drop interface that is simple to master. BigCommerce has become a leading online store building and hosting site through an easy to use, highly-customizable interface that integrates with a wide variety of apps. The company is currently the only Ecommerce site builder that includes PayPal one touch. The company offers a large number of templates, though many of the best ones aren’t free. You can go into the HTML and CSS to change things there if you’d prefer. BigCommerce includes extensive SEO tools and secure hosting to keep your data safe, as well as a 99.9% average uptime. If there are any issues designing your site, you can reach out to the company’s customer support lines 24/7 by phone, email, and live saveable chat. Another great feature is that Bigcommerce can integrate with a number of other Ecommerce platforms, including Amazon, Pinterest, and Facebook. The site also helps manage your store through synchronized inventory tracking. If you’ve decided to set up an online store for your company then you’ve already realized how much putting your business online can boost sales and customer outreach. Before deciding which platform to sign up for, look at your bottom line, how much you can afford each month, and which offer the features that are most important to you. This is a big step for your business, but with the right website builder, it should be painless and get you right on the road to greater revenue and ease of operations.